The Gladiators found themselves trailing the Florida Everblades 4-1 late in the second period of last Friday’s road game. It looked all over for the Glads, but that’s when they mounted an incredible comeback. Bobby Hughes and Casey Pierro-Zabotel trimmed the deficit to one with goals in the second and third periods. At that point things got seriously interesting. Gwinnett took a penalty to put Florida on the power play, but Evan Bloodoff turned the tables on the Everblades with a short-handed goal to tie the game with just fewer than five minutes left in regulation. Florida quickly recovered to take the lead back 5-4. Marshall Everson tied the game for the Gladiators with 3:26 remaining. Finally, defenseman Daniel Spivak took a slap-shot from the blue line through traffic and it found the back of the net to give the Gladiators a 6-5 win in overtime. It was the first win in overtime this season for Gwinnett without going to a shootout. 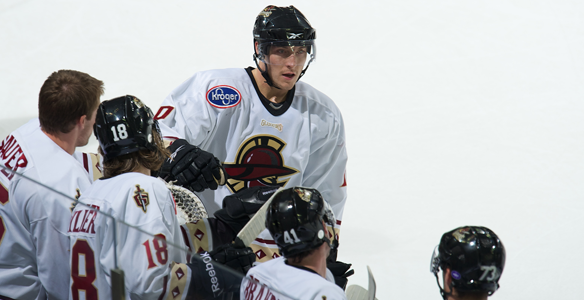 It was also Spivak’s first goal with the Gladi-ators and his first in the ECHL. The Glads are 18-26-3, which leaves them with 39 points in the ECHL standings. Next up the schedule for Gwinnett is a pair of road games against Or-lando this Friday and Saturday. One of Gwinnett’s weaknesses earlier this season was the failure to kill penalties. However, over the last 17 games, the Glads pen-alty kill has been one of the league’s best. The Gladiators have allowed just nine power-play goals in the last 74 power-play chances. The improvement on special teams has the Gladiators ranked fifth overall in ECHL penalty killing. One of the reasons for the better play is the fact that the team is drawing fewer penalties. Gwinnett ranks fourth in the ECHL with 12.79 penalty minutes per game. Everson is in his first year in the ECHL and has come alive over the past 13 games, tallying 12 points. The forward has scored seven goals and notched five assists over that span and he has been one of the go-to players on the power-play for the Gladiators. In 28 games with the Glads, Everson has 12 goals and 10 assists. He leads all active forwards in the ECHL with a 24.9 shooting percentage. Everson played college hockey at Harvard, where he majored in governmental studies.